Identification of the precise 3-D coordinates of iron, shown in red, and platinum atoms in an iron-platinum nanoparticle. In the world of the very tiny, perfection is rare: virtually all materials have defects on the atomic level. These imperfections — missing atoms, atoms of one type swapped for another, and misaligned atoms — can uniquely determine a material’s properties and function. Now, UCLA physicists and collaborators have mapped the coordinates of more than 23,000 individual atoms in a tiny iron-platinum nanoparticle to reveal the material’s defects. The results demonstrate that the positions of tens of thousands of atoms can be precisely identified and then fed into quantum mechanics calculations to correlate imperfections and defects with material properties at the single-atom level. This research will be published Feb. 2 in the journal Nature. 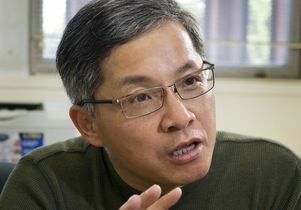 Jianwei “John” Miao, a UCLA professor of physics and astronomy and a member of UCLA’s California NanoSystems Institute, led the international team in mapping the atomic-level details of the bimetallic nanoparticle, more than a trillion of which could fit within a grain of sand. “No one has seen this kind of three-dimensional structural complexity with such detail before,” said Miao, who is also a deputy director of the Science and Technology Center on Real-Time Functional Imaging. This new National Science Foundation-funded consortium consists of scientists at UCLA and five other colleges and universities who are using high-resolution imaging to address questions in the physical sciences, life sciences and engineering. Miao and his team focused on an iron-platinum alloy, a very promising material for next-generation magnetic storage media and permanent magnet applications. 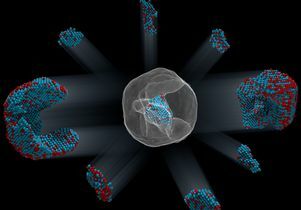 By taking multiple images of the iron-platinum nanoparticle with an advanced electron microscope at Lawrence Berkeley National Laboratory and using powerful reconstruction algorithms developed at UCLA, the researchers determined the precise three-dimensional arrangement of atoms in the nanoparticle. “For the first time, we can see individual atoms and chemical composition in three dimensions. Everything we look at, it’s new,” Miao said. The team identified and located more than 6,500 iron and 16,600 platinum atoms and showed how the atoms are arranged in nine grains, each of which contains different ratios of iron and platinum atoms. Miao and his colleagues showed that atoms closer to the interior of the grains are more regularly arranged than those near the surfaces. They also observed that the interfaces between grains, called grain boundaries, are more disordered. The researchers then used the three-dimensional coordinates of the atoms as inputs into quantum mechanics calculations to determine the magnetic properties of the iron-platinum nanoparticle. They observed abrupt changes in magnetic properties at the grain boundaries. “This work makes significant advances in characterization capabilities and expands our fundamental understanding of structure-property relationships, which is expected to find broad applications in physics, chemistry, materials science, nanoscience and nanotechnology,” Miao said. In the future, as the researchers continue to determine the three-dimensional atomic coordinates of more materials, they plan to establish an online databank for the physical sciences, analogous to protein databanks for the biological and life sciences. “Researchers can use this databank to study material properties truly on the single-atom level,” Miao said. Miao and his team also look forward to applying their method called GENFIRE (GENeralized Fourier Iterative Reconstruction) to biological and medical applications. “Our three-dimensional reconstruction algorithm might be useful for imaging like CT scans,” Miao said. Compared with conventional reconstruction methods, GENFIRE requires fewer images to compile an accurate three-dimensional structure. That means that radiation-sensitive objects can be imaged with lower doses of radiation. The study’s co-authors include Yongsoo Yang, Rui Xu, AJ Pryor, Li Wu and Jihan Zhou, all at UCLA; Mary Scott, Colin Ophus, and Peter Ercius of Lawrence Berkeley National Laboratory; Chien-Chun Chen of the National Sun Yat-sen University; Fan Sun and Hao Zeng of the University at Buffalo; Markus Eisenbach and Paul Kent of Oak Ridge National Laboratory; Wolfgang Theis of the University of Birmingham; and Renat Sabirianov of the University of Nebraska Omaha. This work was supported by the U.S. Department of Energy’s Office of Basic Energy Sciences (grants DE-SC0010378, DE-AC02—05CH11231 and DE-AC05-00OR22725) as well as the U.S. National Science Foundation’s Division of Materials Research (grants DMR-1548924 and DMR-1437263). 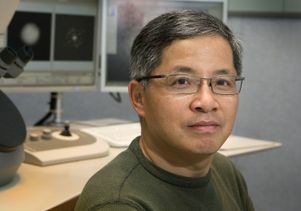 Jianwei “John” Miao, professor of physics and astronomy at UCLA.